The Nine Step Walk and Turn Field Sobriety test is a field sobriety test that many motorists perform extremely well on, despite the officer's conclusion that the test was failed. The exercise is extremely difficult because the exercise has eight instructions that are unfamiliar to most people, the officer typically will rush through the instructions making it difficult to understand what the officer is looking for on the test. The reason that test can be helpful for a motorist is because there are many different clues that the officer is looking for and ways to show that a motorist had good balance and or mental ability in performing the test. Even if the test was not performed perfectly according to the officer, an experienced Massachusetts DUI lawyer can argue that a motorist substantially performed the test and that the test shows good mental ability and balance necessary for safe driving. Officers often score the test unfairly and make it more difficult. 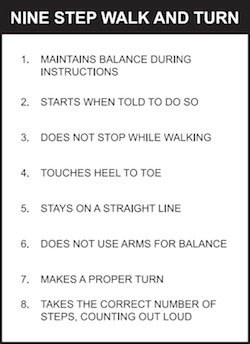 Failure to maintain heel to toe: The nine step walk and turn field sobriety tests requires the motorist to take nine steps out, maintaining heel to toe. Often, an officer’s police report will state that the motorist did not maintain heel to toe. However, the police training manual indicates that maintaining heel to toe is only an indication if there is greater than a two inch gap. Typically, the police report will not indicate how far apart the motorist missed heel to toe. This is an example of unfair scoring on the field sobriety tests, where the test has specific clues while the officer scores the test generally without regard to the details learned in the police training. Arms used for balance: Officers also score the test unfairly by stating that a motorist used their arms for balance without detailing how far the arms were from the body. The test does not require a motorist to walk with their arms glued to their side, but according to the police training manual using arms for balance is only a clue if the arms are more than six inches from the body. Failure to walk on a straight line: Officers typically state in the police report that a motorist failed to walk a straight line. At trial, it is often learned that there was no designated straight line and that the motorist was asked to walk an imaginary line. This raises an issue of fairness of the test as the failure to maintain a straight line requires the motorist to step completely off of the line. Without a designated straight line, an individual’s liberty is dependent on imagining the same line as the officer. Attorney DelSignore view of the nine step walk and turn: Given the number of clues, the nine step walk and turn in many cases will be helpful for the motorist to obtain a not guilty on their DUI/OUI charge at trial. You can call me at 781-686-5924 or 508-455-4755 to discuss your case and defenses.